You are here: Home / Ethnic Groups / The People of Sumatra / Who are the Rejang? The Rejang people live primarily in the province of Bengkulu, mainly in the Rejang Lebong Regency. Some also live in North Bengkulu Regency. The majority of Rejang live on the slopes of the Bukit Barisan mountain range, where the climate is cool and fresh. The Rafflesia flower (the world’s largest flower), as well as beautiful orchids, grow wild throughout this area. The Rejang have been known for their bravery and strength in battle. They have their own language, Rejang, with four dialects. Rejang villages are quite orderly and neat. 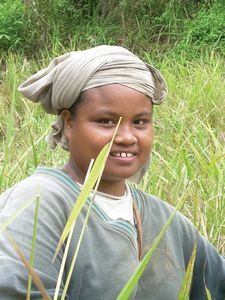 Similar to the neighboring Semendo and Pasemah ethnic groups, the Rejang are good farmers. The Rejang people normally grow coffee for a living. They normally clear land for farming using traditional methods without adding fertilizer and only growing one crop a year. Over the course of a year, a field may be planted with various types of crops mixed together or planted in an alternating cycle. The Rejang are not farmers of any one single crop, but a variety. The father is the head of the home and is responsible for his wife and children. He has to work hard to make a living, and his wife’s job is to help him. The wife is forbidden to work too hard outside the house because this embarrasses the husband. He would be regarded as an irresponsible husband by the community. If the wife lifts a load of a kilogram, the husband should lift a load of at least two kilograms. Ironically, though, in the home the wife carries the majority of the workload. A special and interesting trait of the Rejang is that children from a young age are given opportunities to speak and make their own decisions. Parents respect and support these decisions, even when they are wrong. Educational facilities are readily available in the Rejang area, from elementary schools to high schools and technical schools. However, most children do not take full advantage of these opportunities. The most common reason for dropping out of school is to get married. This normally is not a result of pressure from parents, but arises from the students’ own initiative. These young marriages usually last only a few months or years before ending in divorce. Many later choose to return to school after their divorce. Most Rejang profess Islam. However, animism is an integral part of their daily life and beliefs. For example, a spirit called masumai is believed to be able to take the form of a tiger or a man and is the most frightening of all creatures for the Rejang. They believe strongly in the unseen world and a wide variety of unseen spirits with names such as semat, sebei and roh padi (spirit of the rice paddies). They use magic for many purposes: to harm enemies far away, to make ritual oaths in secret places, and to practice divination at holy sites. The Rejang area needs improved education. Unemployment is high among them because of low education, and many young people drop out of school to marry at an early age.